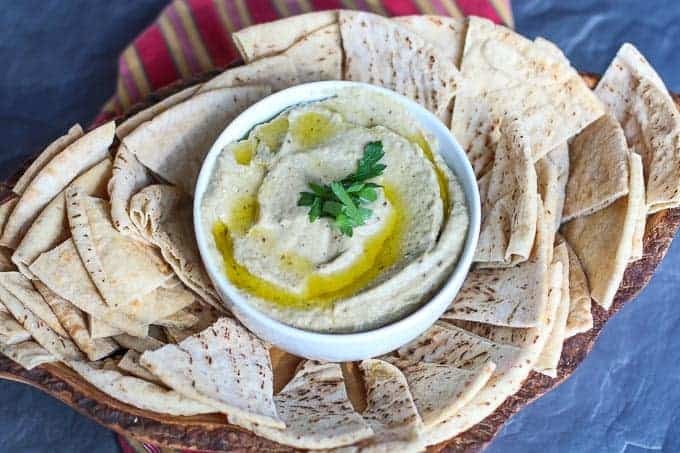 Learn how to make baba ganoush with this easy recipe.It is perfect to make for a delicious appetizer, snack, or for a healthy spread on a sandwich. All ingredients are natural, paleo, whole 30, low carb, and gluten free. 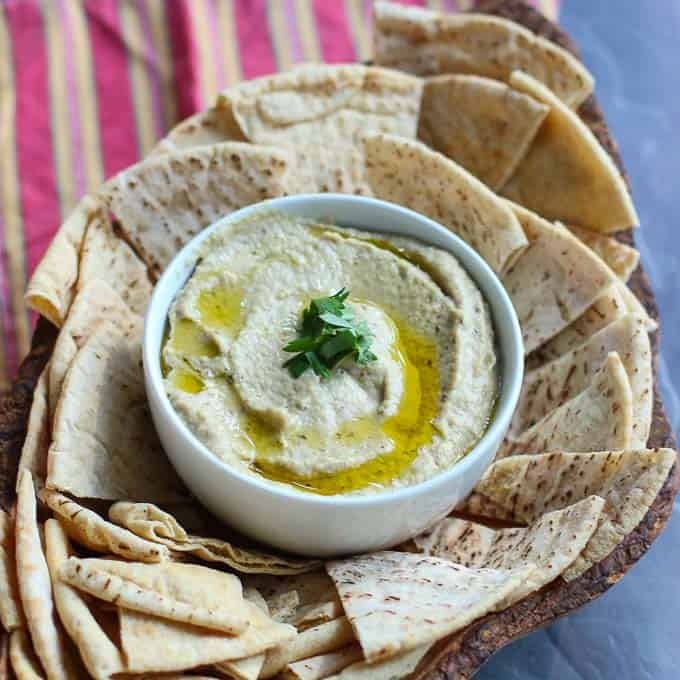 I started making this easy baba ganoush recipe years ago when I was on my low-carb diet. It made a perfect dip for my veggies with no guilt. I loved the creamy soft texture. It is so flavorful. Most people spread it on pita or nan. I am no longer on a low carb diet, but I cut carbs when I can. However, this baba ganoush is amazing if you spread it on pita, then layer it with lettuce, feta, onions, tomatoes, and olives; and eat it like a Mediterranean Pizza…. SOOO GOOD! 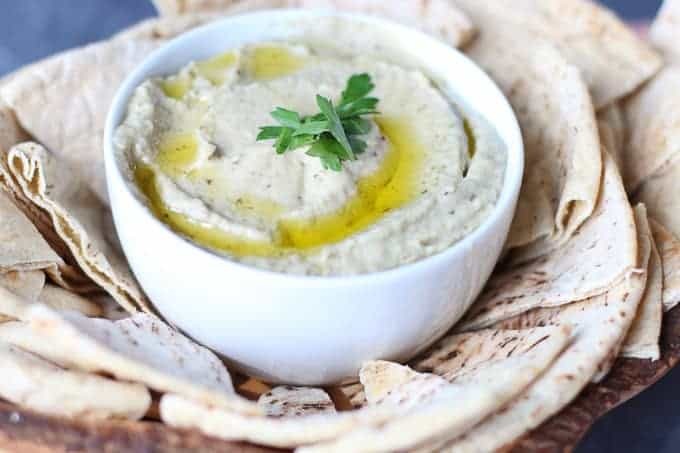 I don’t mean to brag, but honestly, this easy baba ganoush recipe is DELICIOUS!!! It can stand side by side any baba ganoush that you would order in a Mediterranean restaurant. Use a pretty, medium sized eggplant. Roast the eggplant until completely soft. If it isn’t completely roasted, you will have chunks and it won’t be perfectly creamy. Use a good tahini paste. Make sure you mix the tahini paste before adding it to the eggplant. If you don’t mix it properly you will have a disproportionate amount of sesame seeds or oil. Traditional baba ganoush is roasted over an open flame to create a smoke taste. If you want a smokey taste, char the eggplant on the grill or over an open flame before roasting it. Once roasted, scoop out the eggplant and process in food processor with tahini, garlic, cumin, and lemon juice. Salt and pepper to taste. You can drizzle a little olive oil on top for extra flavoring. If you like this recipe, check out: Quinoa Tabouli, Mediterranean Beet Salad, Greek Lamb Meatballs, and Greek Lemon Potatoes. Learn how to make baba ganoush with this easy recipe. It is perfect to make for a delicious appetizer, snack, or for a healthy spread on a sandwich. All ingredients are natural, paleo, whole 30, low carb, and gluten free. Slice eggplant in half. Pierce outside skin with a fork. Lay flat on a foil lined baking sheet. Bake 45- 50 minutes until the eggplant is completely soft and collapsing. Remove from oven. Completely cool. Scoop out eggplant and add to a food processor. Add remaining ingredients. Process until smooth and creamy. Baba Ganoush can be stored in an air tight container up to 5 days in the refrigerator. Yum! Every summer, I grow eggplant in my garden and I have always meant to make baba ganoush. Thanks for the nudge, saving this recipe! Oooooh i’ve never made baba ganoush but it’s been on my bucket list forever. This recipe sounds perfect to try it! 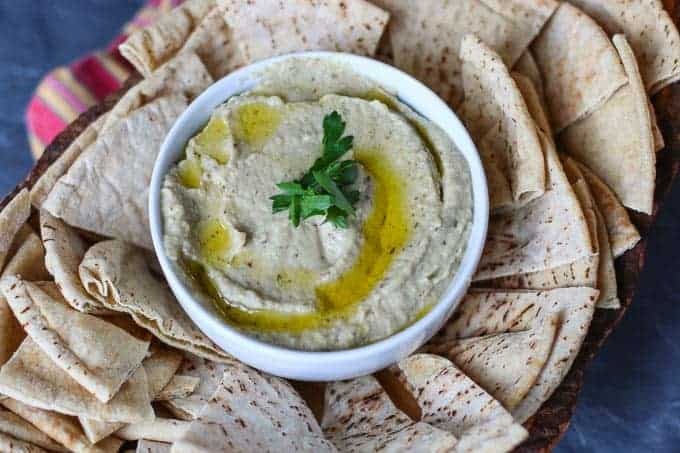 I love baba ganoush but have never made it. This will be the perfect nibble for New Year’s day. Baba ghanoush is one of my favorites, I really should make it more often. So tasty! You can’t beat a great baba ganoush! I like how you cut the eggplant first. Thanks for the recipe.